Located at the sloping SW corner of Fourth Avenue and Seneca Street, this two-story commercial block continues to house retail and office uses. It measures 51’ x 60’ and exhibits classically-derived architectural ornament. 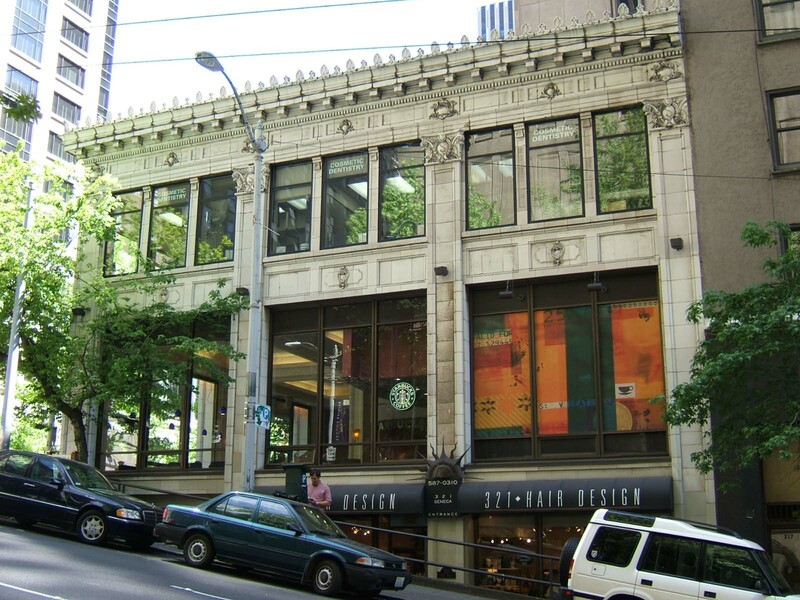 The masonry structure includes a concrete foundation and basement and is clad with ivory-color glazed terra cotta and further distinguished by an elaborate terra cotta cornice with ornate cresting. The two-part commercial block façade is divided by terra cotta pilasters into three bays on Fourth Avenue and three slightly narrower bays on Seneca Street. The two-story structural piers are clad with terra cotta pilasters terminating in composite capitals that are inscribed with an “S.” A highly ornate entablature and cornice crown the building with a frieze of shields and floral motifs, a dentil course, modillions, a molded terminal cornice and cresting composed of alternating acroteria and fleurs-de-lis. Terra cotta decorated spandrels and mullions further distinguish the second floor level. All of the original upper floor level Chicago type windows have been replaced with a somewhat similar modern product. All of the retail storefronts within the original storefront bays (including those oriented toward Seneca Street) have been reconstructed with modern display windows and/or door assemblies. The south bay at Fourth Avenue is most drastically altered. An original glass and metal marquee at Fourth Avenue has been removed. The terra cotta cladding and ornament appear to be damaged and deteriorating. The interior has been entirely remodeled and no intact or architecturally significant interior building features, finishes or public spaces remain in place.